The 6.3"* Infinity Display is the biggest ever for a Galaxy Note-giving you more screen for a bigger view and more space to use the S Pen. Plus, it still fits comfortably in your hand because the symmetric curves and 18.5:9 aspect come together for a narrow body. Even watching movies is simply more enjoyable with the Infinity Display's 18.5:9 aspect ratio. In landscape mode, the Galaxy Note 8 offers a 14% wider viewing area* that makes for a richer, more immersive experience. *14% wider viewing area compared to Galaxy Note 5. The Galaxy Note 8 is designed for you to use with ease and simplicity. The beautiful curves and seamless body are engineered to offer you a comfortable grip and more space for you to write freely with the S Pen. The fingerprint scanner is virtually flush with the back, and the Home button is embedded underneath the Infinity Display to stay invisible until you need it. It's the beginning of a seamless experience. The 18.5:9 aspect ratio was made for multitasking. Turn on Multi Window mode to have two apps open at the same time. For apps you commonly use together, App Pairing presets let you open them simultaneously with a tap. Now it's simpler than ever to listen to music while following Google Maps. Whether you're scrolling Facebook or writing reminders in Samsung Notes, you see more and do more with less scrolling on the tall 18.5:9 display ratio. Draw your own emojis, make animated GIFs, or write handwritten messages on photos. Live message allows you to express your feelings and send them to people you care about. (Depending on the size and length of GIFs they may not be supported by some social media and messaging services). When words aren't enough, you can say it with your own animated GIF. The S Pen's Smart Select feature enables you to select a section of a video and share them with your friends or on social media. You can also select intricate shapes from images to share or paste where you need them. From bullet points to serious artwork and everything in between, Samsung Notes gives you the tools. Use the wide selection of brushes, pens, and colors to draw up plans and create your own masterpieces. Effortlessly save those long articles, emails, and documents as one image, and then add mark-ups just as easily. When we need to take notes or when inspiration strikes, our first instinct is to look for a pen. That's why it made perfect sense for the Galaxy Note series to have the S Pen. The S Pen for the Galaxy Note 8 has a 0.7 mm tip that's fine and precise like your favourite pen, so you can draw and write with accuracy. If you need to undo, just press the button at the side to turn S Pen into an eraser. *Galaxy Note 8 and S Pen are rated IP68, meaning they are both protected against dust ingress and are water resistant. Water resistance rating is based on test conditions of submersion in up to 1.5 meters of fresh water for up to 30 minutes. Camera - Steady does it. The dual camera with dual OIS. Take crisp and clear shots with the Galaxy Note 8's dual camera. Its telephoto camera has 2x optical zoom to let you zoom in clearly. And both cameras have optical image stabilisation (OIS) to produce photos that come out beautifully clear even when taken with a shaky hand! While you're focused on taking a Live focus photo, Dual Capture also what's happening outside the frame. That way you get to enjoy the moments you might have otherwise missed. Great photos are just a snap away even in low light situations. The Galaxy Note 8's wide-angle camera captures more light with its large 1.4µm pixels and bright F1.7 lens, while focusing fast and accurately thanks to the Dual Pixel Sensor. Flip to the front camera to take a selfie or group shot you'll be happy to share. Its bright lens keeps details clear even in low light, while Smart Auto Focus tracks the faces in the shot. Every day brings new memories to make. Keep them on your Galaxy Note 8 and continue to create new ones with a storage capacity that's expandable by up to 256GB via microSD card (MicroSD card sold separately). 10nm AP + 6GB RAM - Powerfully fast - Playing visually rich games or switching between apps is a breeze. The 10nm mobile processor works with the 6GB RAM to make it happen fast and seamlessly. Browse the web, download files, and stream videos with speed and ease. 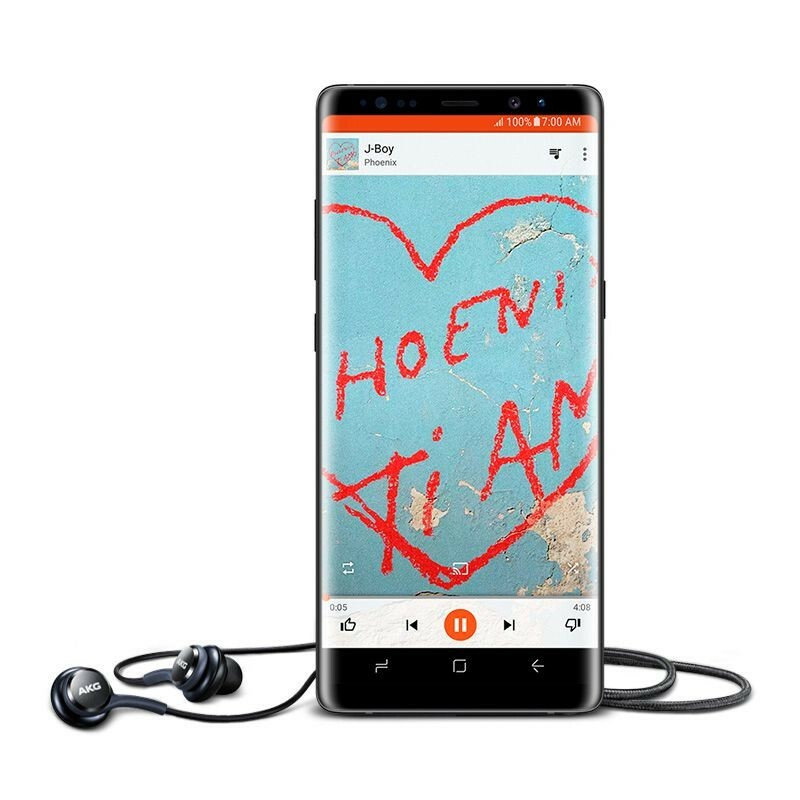 The Galaxy Note 8 supports both gigabit LTE and gigabit Wi-Fi, meaning that it's built to give you exceptional connection speed by tapping into network speeds that can go as high as 1 gigabit per second. Games heavy with graphics feel light on the Galaxy Note 8 because it supports Vulkan API. With Vulkan making fast connections between computing and graphics, what you get is beautifully smooth performance that doesn't drain your battery as much as its predecessor. Good music deserves to be heard through good earphones. The Galaxy Note 8 comes with earphones tuned by AKG and packed with 11F woofers and 8F tweeters. It also comes with 3 months of Google Play Music on us, so you can put those earphones to good use by listening to over 40 million songs, ad-free and on-demand. When it's time to charge your phone, you don't have to worry about cords. Simply put it down because the Galaxy Note 8 charges wirelessly. (Wireless charger sold separately). If you get splashed or caught in the rain, you can carry on using your Galaxy Note 8 because it's water and dust resistant. (IP68 certified water resistance for up to 30 minutes in up to 1.5m of water. Rinse thoroughly in fresh water after salt or chlorinated water exposure). Unlock with your eyes, your face, or a press of your finger. Samsung Knox protects your biometric data as well as safeguarding what's on your phone, for complete peace of mind.